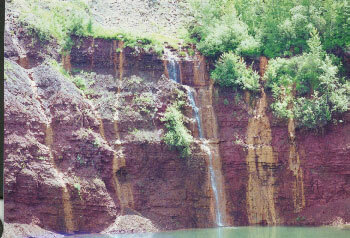 Looking at this side of the pit (left) from the top of the waste piles (looking west) it is easy to see the lighter colored overburden and the reddish ore. The waste piles are about 200 feet high and occupy about 40 acres. 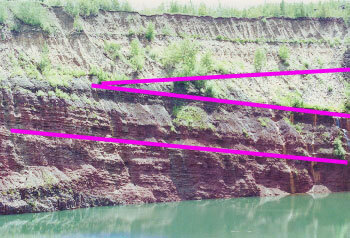 The arrow (top left photo and top arrow of the bottom left photo) points to the unconformity between the two deposits. 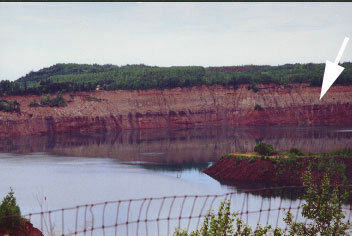 Notice how the formations dip to the south (left) so that there is more ore exposed above the water at the right side of the photo and less at the left. The sign at the entrance said that the pumps have been shut down but the tour guide said that they still need to pump water from the pit to protect the town from the rising water level. About 3 million gallons flow into the pit each day and when the pumps are running they can pump out about 8 million gallons a day. The pumps are visible in the bottom left photo at the end of the lower arrow. The photo at the lower right shows how the water level has risen over the road that leads to overlook of the osprey nest. The water level has risen in the last few months from a combination of lack of funds for both repairs and electrical costs and the agreement with the power company to shut off the pumps when high electrical demands are required because of increased air conditioning use. The photo at right shows the bedding at the side of the mine. 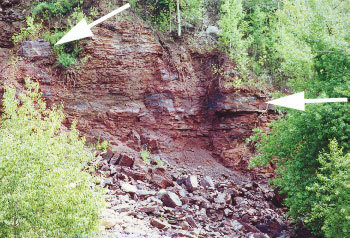 The arrows point to some layers with a greater iron content where the color is a much darker gray, the rest of the material is a reddish colored chert that contains much smaller amounts of iron and became waste material from the mining operation. 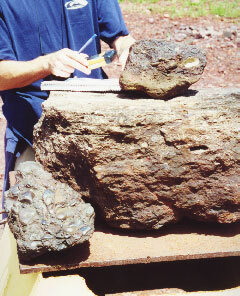 The photo below shows the overburden as well as the start of the ore containing body. 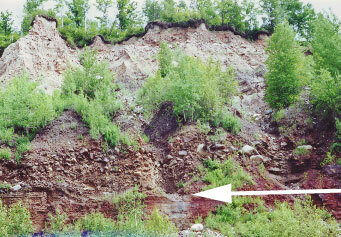 The top arrow points to the boundary between darker and lighter glacier material, the darker material having been deposited by the St. Louis Sublobe and the lighter material by the Wadena Lobe. The photo below right is a closer view of a similar area. 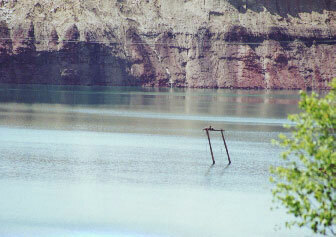 The arrow is pointing to a small body of high iron content ore. 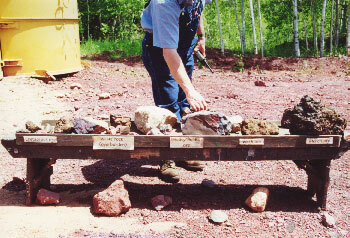 The photo (left) shows a close up sample of the hematite ore. Notice the folding that has occurred in the rock as well as the waste bands of rock. While the rocks may look small in the photos the people in the photo at the bottom left give some scale to the rock formations. 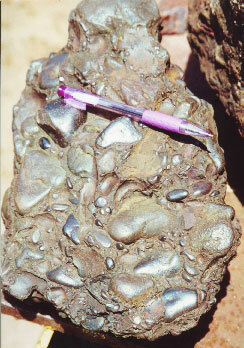 In this photo some high quality ore can be seen intermixed with the waste rock. In the bottom photo of a closer view of the ore containing rock the bands of ore layered between bands of waste are visible. This photo shows some of the old mining equipment in behind the tour bus. 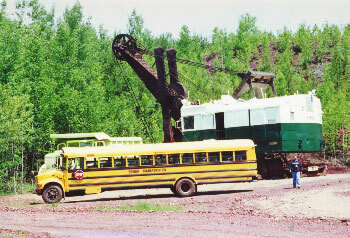 The large shovel was steam driven in the early operation of the mine and one of the trucks is visible just over the top of the bus. The lower photos show the bedding of the ore with the glacial overburden on top. The incline of the beds from north to south suggest that more good ore lies further to the south but to reach it would require moving the town of Calumet. 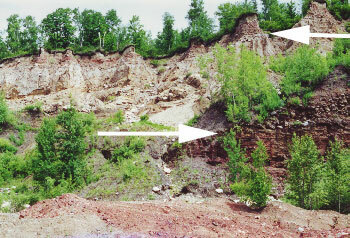 The photo at the bottom right emphasizes the angular unconformity between the glacial deposits and the iron formation. The photo above left shows some of the source of water entering the pit. 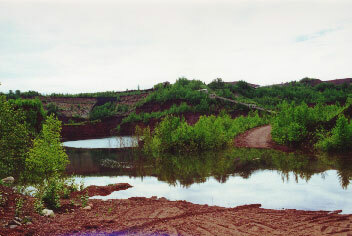 Rain water leaches down through the glacial deposits, hits the shale and then follows it to the pit edge. The result is what looks like a natural spring with water flowing from the side of a hill or mountain. The other two photos show the osprey nest on top of a power line pole near the end of the conveyor system of what was called the A pocket. 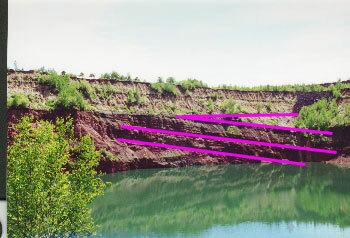 The arrow of the photo above points to the boundary layer between the glacial deposits and the ore. 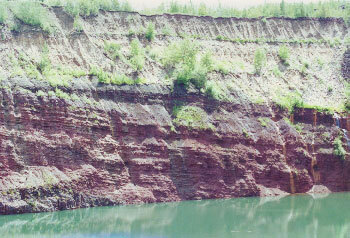 There is about 200 feet of overburden and about another 300 feet to the point where they were last mining ore. This photo shows the kinds of materials in the mine. The scanned photo does not show much detail but the signs are easy to read on the original. At the far right is the "Merch Ore" that was of good enough quality to ship to steel mills without processing. Going left is the "Wash Ore", a fine ore that would be separated out with a water solution in equipment called Humphry swirls. 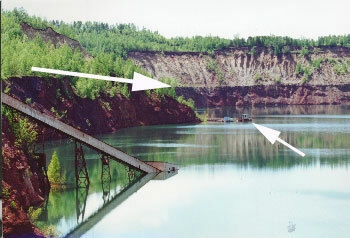 The "Heavy Media Ore" was separated out in large tanks where the lighter waste would float off and the heavier iron containing ore would sink and be transported out. 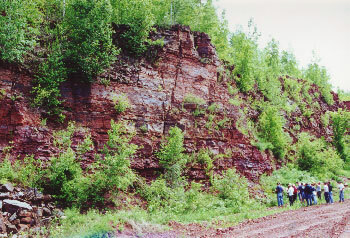 The waste rock or overburden is second from the left and the far left rock is Cretaceous ore, named for the time period it was formed. 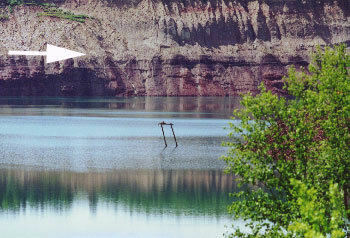 The Cretaceous ore contains marine fossils that were present in the Cretaceous period of Earth's history. 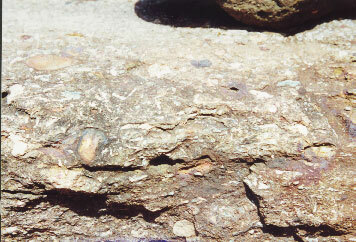 This photo shows a closer view of the ore with fossil remains visible. 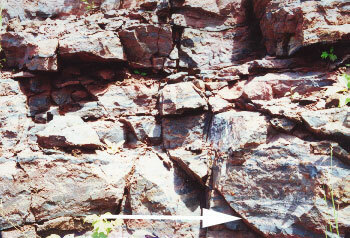 A thin layer of Cretaceous ore was sandwiched between the glacial overburden and the main iron containing ore. These photos show the different kinds of ore in the mine. The photo at the right shows a close-up of the Merch Ore. 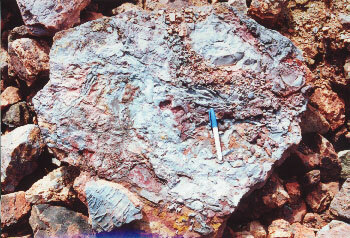 It is a conglomerate type ore with large parts of hematite.